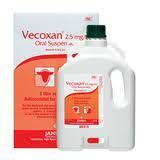 For the treatment and prevention of coccidial infections in lambs and calves. Lambs - Dosage rate is 1ml per 2.5kg body weight at about 4-6 weeks of age at the time coccidiosis can normally be expected on the farm. You must treat all lambs of the flock. Calves - Dosage rate 1ml per 2.5kg body weight administered as a single dose, 14 days after moving into a potentially high risk environment. Vecoxan should be administrated with a drenching gun. Withdrawal period for Edible tissues is zero days.